The Combined Security Transition Command - Afghanistan (CSTC-A) has ". . . significantly increased its budgetary controls through the Commitment Letters signed with the Ministry of Defense (MoD), Ministry of Interior (MoI), and the Ministry of Finance (MoF). These agreements enhance transparency, accountability and oversight of international donations by requiring the implementation of transparency measures such as published spend plans, contractor vetting and audits." 1. A passage from an October 2015 press release by MG Todd T. Semonite, a former commander of the Combined Security Transition Command - Afghanistan (CSTC-A) provides some clarity on the purpose and scope of the commitment letters 2. "Annually, CSTC-A and the ANDSF mutually draft and sign commitment letters that establish conditions the Afghan government must meet in order to receive funding, equipment or infrastructure. This year leaders from the Ministry of Defense, Ministry of Interior and the Ministry of Finance signed the letter, obligating their organizations to meet 93 (45 MoD/48 MoI) mutually agreed-upon goals. These goals drive Afghan government processes and save millions of dollars in donor contributions by reducing fuel and ammunition excess (by 40 and 60 percent, respectively), addressing corruption at multiple levels, and setting procedures that reduce fraud and abuse opportunities. It is the commitment letters that enable CSTC-A the leverage to hold or debit funds and drive fiscally responsible behavior. As we look forward to 2016 the letters will be more detailed and ask even more of the Afghan government." CSTC-A is attempting, through the use of commitment letters, to provide performance incentives and apply penalties (call it carrot and stick) that will prompt the MoD and MoI to show "demonstrable improvement in their capacity and capability in personnel management, resource management and procurement, and logistics and maintenance, with an overall goal of sustainability over the long-term". 3. The letters establish expectations for the responsible management of a variety of international funds to include the Afghan Security Forces Fund (ASFF), the NATO ANA Trust Fund, and the United Nations Development Program (UNDP) LOFTA. In addition, the CSTC-A commitment letters also identify various legal constraints, such as the Berry Amendment and the Leahy Law on U.S. funding. The chart below provides insight into the number of 'conditions' associated with the commitment letters and how many of the conditions have been met by MoI and MoD. Chart is from page 114 of SIGAR Quarterly Report Dec 2016 4. How Do Commitment Letters Actually Work? Provisions are agreed upon and cited in the committment letters. For instance the ". . . CSTC-A financial-committment letter to the MOI for Afghan FY 1394 includes the LOTFA Steering Committee mandate for the MOI to provide 100% of ANP salaries through electronic funds transfer. To incentivize the MOI to use electronic payment systems, CSTC-A is to provide funding only for those authorized tashkil positions being paid electronically, once the automated pay system is ready for use later in 2016." 4. DoD IG, The Government of Islamic Republic of Afghanistan's Controls Over the Contract Management Process for U.S. Direct Assistance Need Improvement, Report No. DODIG-2015-082, Inspector General U.S. Department of Defense, February 26, 2015. (FOUO). This report is highly critical on the failure to implement measures that would prompt the Afghan MoI and MoD to properly manage the international funds provided for the ANDSF. Posted on website of the Federation of American Scientists (FAS). SIGAR, Challenges to Effective Oversight of Afghanistan Reconstruction Grow as High-Risk Areas Persist, statement of John F. Sopko before the U.S. Senate, Special Inspector General for Afghanistan Reconstruction, February 24, 2016. 1. 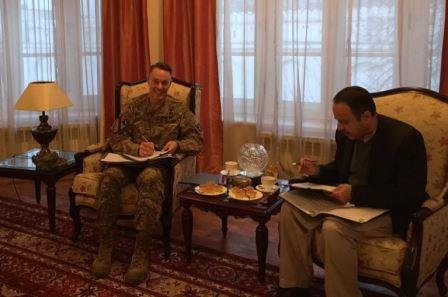 Quote taken from US Forces continue to improve management of ANSF funds, USFOR-A Public Affairs Office, December 2013. 2. See Building capacity, capability of Afghan Forces, by MG Todd Semonite (CSTC-A), army.mil, October 2, 2015. 3. See Enhancing Security and Stability in Afghanistan, U.S. Department of Defense 1225 Report, December 15, 2015, page 3. 4. See page 88, Quarterly Report to the United States Congress, Special Inspector General for Afghanistan Reconstruction (SIGAR), January 30, 2016.